The Kensington KeyFolio not only protects your iPad when on the road but also provides a handy wireless Bluetooth keyboard and handsfree stand when you reach your destination. 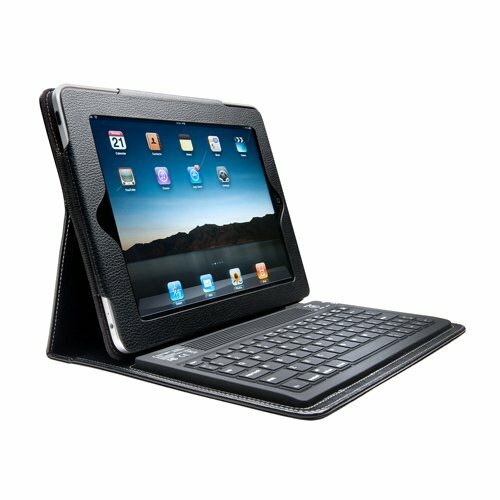 The rubberized keys were specially designed to cushion your iPad screen from bumps and scratches when the folio is closed. The magnet-free case ensures uninterrupted operation of the iPad's digital compass. The KeyFolio offers solid protection with a durable synthetic leather cover that protects your iPad in style. 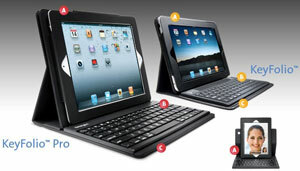 The tactile rubberized keys are spill-proof and also protect your iPad's screen from scratching when closed. A Bluetooth keyboard built into the KeyFolio delivers wireless operation and includes iPad-specific keys for comfortable navigation between apps and your iPad's Home screen. The case provides easy port access to all iPad controls and 30-pin connectors. A camera opening allows for FaceTime use without removing the iPad from the case. The adjustable stand securely holds your iPad in landscape mode. 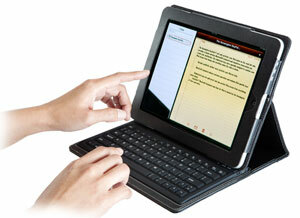 The KeyFolio Bluetooth Keyboard Case is backed by the Kensington 2-Year warranty. There are some good reviews here, but i wanted to respond to the few negative reviews. First, there may be some people who don't know how to set up a bluetooth connection properly, and they need to get some help, because this is a great little keyboard and case. If you still have troubles, once it is set up correctly, then you likely have a bad unit and should return it for a good one. This types and protects wonderfully. After my ordeal of getting an iPad 2, I knew I needed a keyboard case (since my desktop died). I'm a professional blogger, and I need an efficient way to input information, and touching the screen wasn't going to cut it. 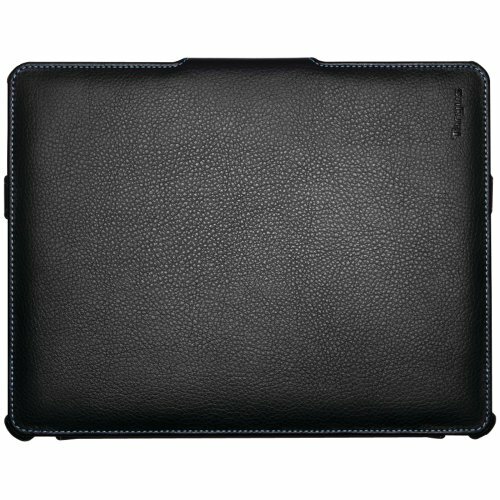 When I first saw the Kensington case for the iPad 1, I toyed around with the idea of purchasing it. Then I went through the aforementioned ordeal, and the new cases wouldn't be shipping out until after April. I just happened to look on the site last week, and it was available, so I purchased it. I received it in 2 days, and I love it. The bluetooth is responsive, and the USB cable fits into my Kindle electrical plug so I can charge it at the same time the iPad 2 is charging. I absolutely love it. The smell of the case is a little off putting, but for what it does, I'm completely happy with it. Amazon never lets me down. It is designed specifically for the iPad 2. It features a thin, lightweight design. The unit dimensions are 9.53-inch L x 7.68-inch W x 0.59-inch. The Targus Protective Cover/Stand for iPad 2 features a form-fitted design. The Protective Cover or Stand is ultra-thin and lightweight. The case also provides full access to all iPad functions so the iPad is fully operational. The lowest angle is ideal for typing directly on the iPad screen. The Targus VuScape Protective cover and stand is a pretty good, helpful aid for those who own an Apple Ipad2. It features a thin, lightweight design that is meant to hold the iPad2 snugly in place while you work. Having a stand for your iPad is certainly a good idea and I like that this stand can be used to position your iPad in different ways. There are multiple grooves so that you can display your iPad at different angles. The cover can also be folded back completely, allowing the consumer to hold the iPad in the hands without the stand. The Targus VuScape Cover fits my Ipad 2 like a glove... LITERALLY. I had been looking for a case for my device and when I saw this one from Targus, I figured I'd give it a try. First, the case is made out of VERY high quality imitation leather. I mean it really looks like the real thing (the PU smell gives it away, though). It's sleek and tight fitting, which I love. You simply SLIDE your iPad through the two side "hooks" and lock it into place by the top hooks. The bottom hooks are just for SUPPORT, not for locking in the device. Since the case doubles as a stand for the iPad, the bottom portion of the cover slips back and allows you to stand the device in one of the two grooves in the cover. This works splendidly and holds the device quite well. This is a very simple and elegant looking case that's unobtrusive and will protect your tablet, while doubling as a stand for watching videos or surfing the net. I highly recommend this case.